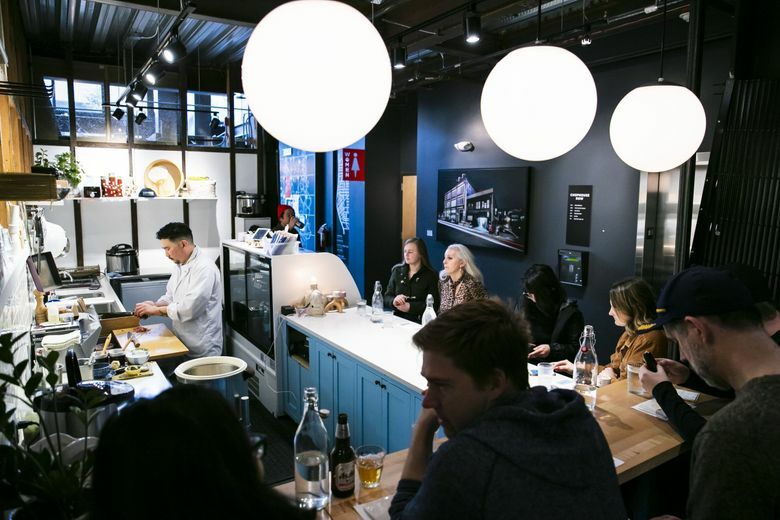 Chef Sun Hong serves a $25 set menu at lunchtime only, weekdays only at his hidden-away, eight-seat counter — and when you're there, you're a friend, part of his crew. The first time I went to By Tae, chef Sun Hong was wearing an eyepatch. It wasn’t full pirate-style — more like the right lens of his glasses blocked out, giving him a slightly mad-scientist aspect in his spotless white jacket. Sun — everybody calls him Sun — commandeered this tiny spot inside Seattle’s Chophouse Row development on Capitol Hill this past November. By Tae, which means, very roughly, “by hand,” is just a counter, only eight seats for eight lucky people to climb aboard. By Tae is lunch only, weekdays only, Sun-manned only, no reservations. The menu is chef’s choice, including nigiri, sushi hand rolls and sometimes more — this, the world’s most low-key omakase, costs $25 per person. The music might be the Cure and INXS. Sun introduces himself to pretty much everyone, sometimes coming out to hug somebody. The pace of lunch is leisurely, like sitting around a friend’s kitchen while they casually cook, handing food to you. It’s arguably best to come alone, definitely best to leave your laptop at home; if you’re in a hurry, come early to get $15 grab-and-go sushi rolls. Sun jokes around but also listens carefully. If somebody asks where he gets his fish, he’ll talk about how experts assess the best stuff, then about skateboarding, about how the guy who gets him his excellent toro is part of his crew and how you are, too. He might show-and-tell a hunk of tuna on a tray — ruby-red, practically glowing, shaped like a big roast. Someone might threaten to grab it and run away. There’s a lot of laughing at By Tae. Sun’s joy belies his focus, his almost undetectable intensity. 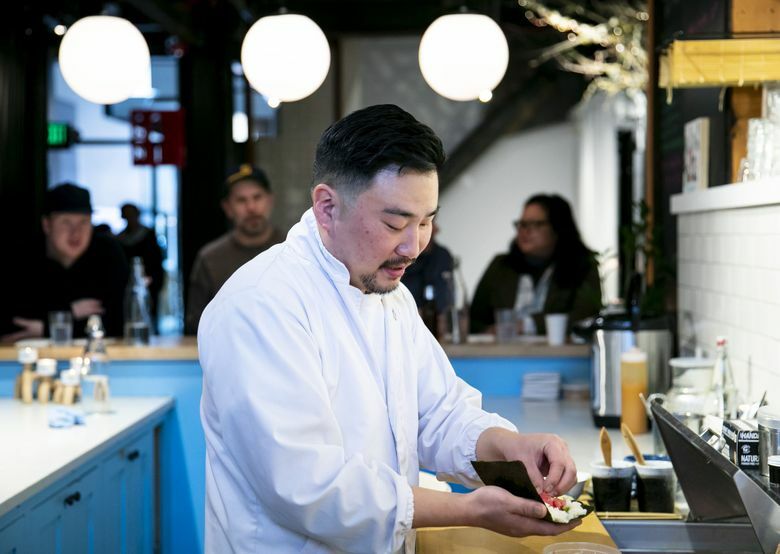 He rocks back and forth a little as he pats rice into pads, then deftly scores hamachi belly with perfect parallel lines, making it taste even more daintily buttery, with a brush of ponzu for a citrusy contrast. When he’s working with an ingredient that really pleases him — like local uni, from near Anacortes — he’ll cackle to himself with quiet glee. Your $25 lunch starts with a few pieces of nigiri, served one by one as they’re made by Sun, the fish very fresh, the rice just right. 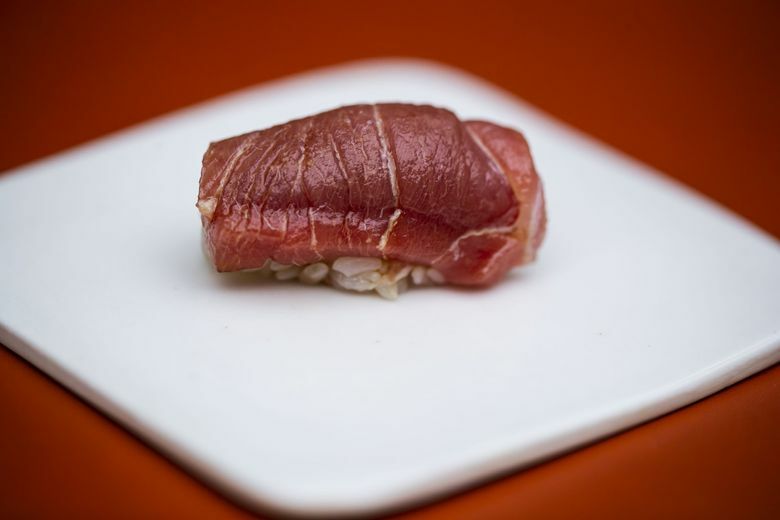 They may not be without flaw — once I got one made up of two smaller slices of chūtoro, something that sushi chefs just don’t do — but, then, the perfect is the enemy of the extraordinarily good price point at By Tae. Call it wabi-sabi — the Japanese concept of beauty as possessing fault and being fleeting, and more beautiful for it — as it goes down the hatch. The hand rolls are big, and everybody gets three. They’re so lovely, eyes go wide. 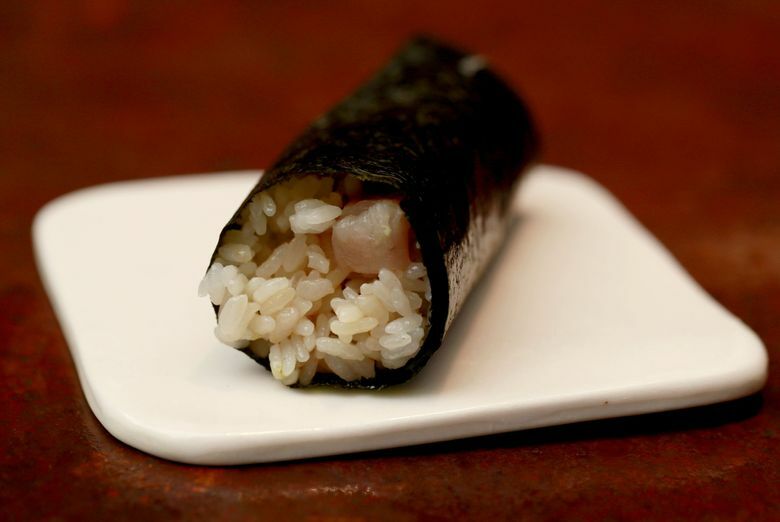 If someone stops to take a photo, Sun may shame them very lightly — as the By Tae blackboard says, “for best results, don’t wait, eat quickly.” The nori, the seaweed that wraps a hand roll into a handheld treat, should still be snappy, the whole thing eaten in a few big, happy bites. Hamachi gets quickly diced with green onion and grated young ginger, which, he’ll explain, he loves for its pink hue and how it pulls its gingery punch, tasting almost sweet. By Tae sometimes turns into a mini cooking class, with Sun offering that young ginger’s available, in season, at Uwajimaya. Or he might discourse most casually about balancing salty, spicy, bitter, sweet. The attentive will also absorb the wisdom of serving something crunchy after something soft, heavy after light. Some people get lost in eating here, just murmuring “Mmmmmm.” A hand roll of creamy, pillowy Hokkaido scallops with Sun’s sake-marinated, cherry-smoked ikura and shiso elicits muffled, mouth-full expletives about its goodness. The salmon roe pops with salt and the subtlest taste of the best campfire, the shiso makes a minty spike, the scallops loll on the tongue. The only extras are miso soup and a handful of beverages, including genmaicha (the kind of green tea that Sun used to brew every morning with his grandma), sake (maybe including an off-blackboard special), beer and natural wine (chosen by L’Oursin’s Kathryn Olson, who’s also part of Sun’s crew). “I don’t want to take the prestige of the famous places I’ve worked at,” Sun explains. “I just want to be right here, right now.” His point-of-sale system is a borrowed iPad. He points out the proximity of the door to the women’s restroom and laughs. What happens when By Tae gets this spotlight, right now? How will he manage more people wanting to come? Sun says he consulted his fiancée and friends before agreeing to talk to me. For my part, By Tae’s the kind of place you selfishly don’t want to write about. But the secret will get out. “You can’t recork the Champagne!” Sun says. He may, however, end up taking reservations. The eyepatch is gone now — I never heard what happened. The mystery suits Sun. By Tae, 1424 11th Ave., Suite E (inside Chophouse Row, Capitol Hill), Seattle; no phone; facebook.com/bytaeseattle; Monday-Friday 11:30 a.m.-2:30 p.m.